Why are Save the Date Magnets Great Choice for Graduation Day Gifting? Graduation day memories are always dear to heart. We all love to secure memories of that great day in special manner. The day unravels with different rituals – such as parting speech, photo sessions, autograph book scribbling, gifting, etc. Gifting is one of the most important rituals of this day. The priority is laid on a memorable gift than an expensive gift. Isn’t it? Why don’t you consider a unique gift, which fits into various roles without bothering your budget (we’ll discuss it later)? Yes, aptly speaking it is none other than a save the date – graduation day magnet. What is graduation save the date magnets? As the name suggests, these are typical type of graduation invitation magnets largely employed for value building by graduating students, parents and their proud teachers. On hitting a reputed online store selling custom magnets you’ll find innumerable choices for these magnets in different sizes, shapes, and price ranges. These magnets work on typical theory as save the date wedding magnets, with a difference of inviting people for other another red letter day in life – graduation day! 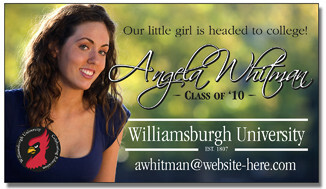 Why are personalized graduation magnets –save the date going to be a very smart gifting choice for you than others? As suggested above graduation announcement magnets –save the date can serve many purposes with ease. It becomes a diligent invitation, memoir, and a delightful refrigerator art that also at a single price! It perfectly gels with the fabric of the situation and mostly fits into budget of students (trying to buy gifts from their meager savings or pocket money), parents (trying to make it all memorable and special for their kid on his/her special day with meager investment) and teachers (trying to make it all special for their students to remember for ages to come). If you belong to any of these three genres, then you are going to make the right choice by investing in this magnet for graduation announcement. How can you make it a beneficial buy than other promotional, invitation or individual magnets? You can make best deal out of these graduation day magnets by bulk ordering them from any reputed online store selling magnets. You can find them at best buy prices at any of these websites. Free shipping, free art set up and free online proof are some of the handsome perks that you can expect while buying from reputed online magnet stores. Make your graduation day- an extra special affair with these graduation invitation magnets – save the date.